Jazz forward Thabo Sefolosha will start the season under suspension. That creates a big opportunity for Georges Niang. 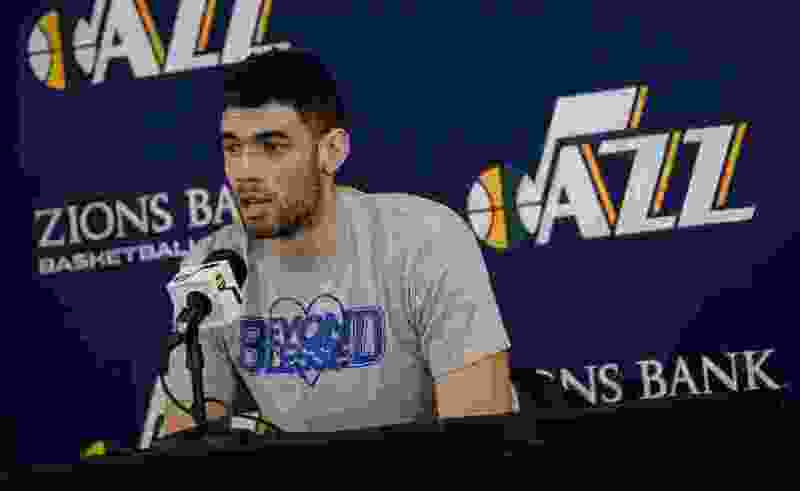 (Francisco Kjolseth | Tribune file photo) With Thabo Sefolosha suspended for the start of the season, Utah Jazz forward Georges Niang likely will see more playing time. Just as the Utah Jazz were getting used to having Thabo Sefolosha back in the rotation again, they’ll be forced to play without him. That’s because in April, while he was recovering from knee surgery, Sefolosha was suspended five games for violating the NBA’s anti-drug program. A five-game suspension is the penalty in the league’s collective bargaining agreement for the third positive test for marijuana. But because Sefolosha was hurt, he couldn’t serve the suspension until he was physically able to play, and preseason games don’t count. In other words, Snyder sees Sefolosha as a four this year, after starting his career as a shooting guard. It’s reminiscent of former Jazzman Joe Johnson’s career progression down the positional spectrum. The man Snyder named first, Niang, now looks like he’ll get at least a chance to play in the rotation during Sefolosha’s suspension. Niang, 25, has had a stellar preseason, averaging 8.4 points on 64 percent overall shooting (50 percent from 3-point range) in only 12.7 minutes per contest. The 6-foot-8 Niang isn’t the Jazz’s quickest or most athletic player, but his high skill level allows him to be a solid fit in most lineups. Niang knows that he isn’t going to be the featured scorer when he does play but knows what he needs to do to fill his role. He’s also a trendsetter of sorts for the Jazz: the first two-way contract player to sign a full contract with the team for the following season. Because of that, the organization feels more comfortable in his ability to step in and play the Jazz’s offense than they might be a typical signing, who only has a couple of weeks of training camp under his belt. Niang, on the other hand, knows the offense well from the point of view of multiple positions. Niang’s impact on the SLC Stars last season was “humongous," according to Stars head coach Martin Schiller. The Stars had an 11-4 record when Niang played with the team, and a 5-30 record without him. Over the weekend, the Jazz waived four players, Stephaun Branch, Isaiah Cousins, Jairus Lyles and Isaac Haas. That allowed them to reach the NBA-mandated roster limit of 17: 15 NBA spots and two two-way players. All four players figure to be headed for the Salt Lake City Stars roster through the league’s “affiliate players” stipulation.